A new spatial speech-in-speech test was developed. The test enables different participants to perform within the most sensitive %-correct range at the same Signal-to-Noise Ratio (SNR). Furthermore, it allows performance at higher and more ecologically valid SNRs than those typically observed in common adaptive speech tests. Measuring Speech-Reception Threshold (SRT) using adaptive procedures is popular, as testing yields results at the steepest, most sensitive part of the psychometric functions of individual test subjects. However, the SNR at which the SRT is achieved is not kept constant in this test paradigm. The range of individual SRTs can easily span 10 dB when measuring a group of hearing-impaired listeners. If hearing aids (HA) are used during the testing, this SNR variation may confound the results if the HA processing depends on the SNR. Further, the observed SRTs are often much lower than what is encountered during everyday life, which compromises the ecological validity of the result. If HAs are involved, very low SRTs mean that these devices may be operating in conditions for which they were not intended. The limitations of the SRT measure are further discussed here. In order to address the problems with SNR confounds and limited ecological validity, a new speech test, the SFS test, was developed. The basic concept of the SFS test is to prescribe an individual test set-up to each test participant such that all participants perform within (or close to) a range of 50-70% correct at a common fixed SNR. Based on the (adaptive) SRT measured in a baseline test condition, test participants will be assigned to one of four possible test set-ups implemented in the loudspeaker set-up shown in Figure 1. The set-ups include different combinations of masker configuration (±15°/30°/45°), masker gender (m/f), and scoring in %-correct words (W) or sentences (S). 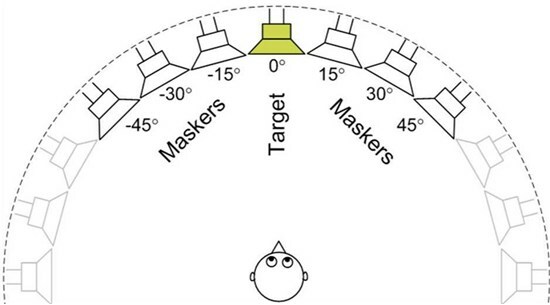 The target signals are HINT sentences spoken by a male talker, and the two masker signals are recordings of running speech from two different talkers. The four conditions, and their expected SRT shift, as compared to the baseline SRT, are shown in the table below. The SFS test was validated in a study with 26 participants. The participants were assigned to two different groups with target SNRs of -5 dB and +5 dB, respectively. Based on the individual baseline performance, a SFS test condition was chosen (among the four listed above), which would bring the expected SRT as close to the target as possible, and thereby bring performance at the target SNR within the 50-70%-correct range. Figure 2. Percent-correct scores in the baseline set-up (left plot) and the SFS set-up (right plot), for the two test-subject groups. Besides demonstrating the SFS test’s ability to manipulate individual performance in a given direction, the validation experiment furthermore demonstrated a high reliability of the test. The observed test-retest standard deviation was around 9% correct. This allowed a difference between the two HA settings to be shown with high statistical significance. The SFS test will also be implemented at Oticon headquarters. It will be verified that the SRT ‘manipulation’ effects observed under anechoic conditions at Eriksholm can be replicated under more reverberant test conditions. Laugesen S, Rønne FM, Jensen NS, Sorgenfrei MG (in press). Validation of a spatial speech-in-speech test that takes Signal-to-Noise Ratio (SNR) confounds into account. Proceedings of the 4th International Symposium on Auditory and Audiological Research (ISAAR), Nyborg, Denmark, August 28-30, 2013. 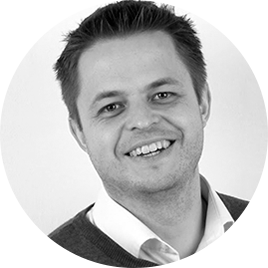 Rønne FM, Laugesen S, Jensen NS, Hietkamp RK, Pedersen JH (2013). Magnitude of speech-reception-threshold manipulators for a spatial speech-in-speech test that takes signal-to-noise ratio confounds and ecological validity into account. Proceedings of Meetings on Acoustics (POMA), Acoustical Society of America (ASA), vol. 19(1), p. 1-9.